This nature reserves extends over three areas of ancient semi-natural woodland although only one of them, Coed Wen, is open to the public. The predominant tree species in the woods are Ash, Small-leaved Lime, Wych Elm and Wild Cherry. Management of the site includes coppicing the trees regularly in order to maintain a reasonably open canopy that allows plenty of light into the woodland for the benefit of the woodland flora beneath the trees. This woodland reserve is situated on the tops and slopes of the limestone hills just outside Newport, and this site is an example of an increasingly scarce habitat in the UK. The special plants in the woods reflect this unusual environment and are similarly scarce in Britain. Penhow Woodlands NNR is an excellent place to see our visiting and native breeding birds in spring and summer. The reserve is also home to populations of the native Welsh Daffodil (Narcissus pseudonarcissus). From Newport follow the M4 motorway towards Bristol, leaving at the Magor (23A) exit. Continue along Bowdens Lane for about 1.5km, passing Skeviot Farm on your left. The main entrance to Coed Wen (the part of Penhow Woodlands open to the public) is 220m further on, on the right-hand side of the lane. There is room for three cars to park there. 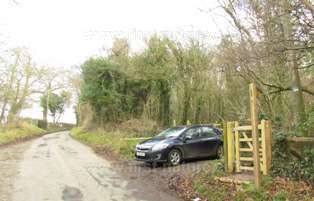 Slightly further up the lane is Bowden's Farm on the left with another entrance into the woodlands immediately opposite, but there is no parking there. From the main entrance there is a circular nature trail some 1.5km in length. There is another public footpath at the northern end of the woods. Both paths are narrow and steep in places and can be slippery in wet weather. There are a number of stiles and gates to negotiated throughout the reserve. Good walking shoes or boots are therefore essential. There are no facilities at the reserve, but there is a motorway service station at Magor with cafés and public toilets. In springtime Penhow Woodlands is one of the best places to see (and relish the scent of) Bluebells (Hyacynthoides nons-scripta) along with many other lovely spring wildflowers such as Primroses (Primula vulgaris), Wood Anemone (Anemone nemorosa) and Lesser Celandine (Ranunculus ficaria), the latter brightening the edges of the woodland paths as early as February on warm sunny days. 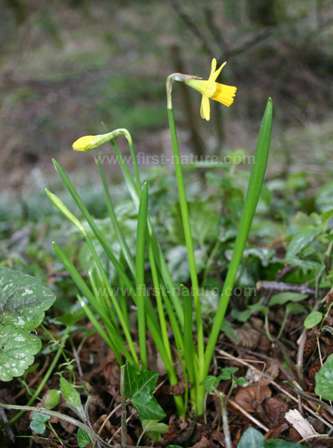 Springtime is also the time to see the native Welsh Daffodils that grow in the woods. They are smaller and more delicate than the garden blooms and they grow to a height of around 50cm. Their trumpets are deep golden yellow, while the outer segments are rather paler. Wild Daffodils can bloom as early as February and continue to the end of April depending on the warmth of the spring; they are one of the wildflowers that benefit most from the woodland management, including coppicing, at Penhow Woodlands. 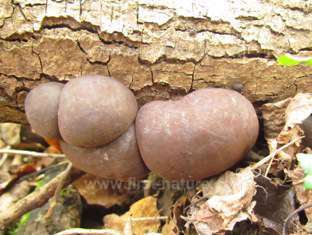 Below: Young fungal fruitbodies known as King Alfred's Cakes (Daldinia concentrica) grow on fallen wood. As they age they become black - hence the common name. Other interesting plants in these woods include the strange-looking Herb Paris (Paris quadrifolia), which has narrow yellowish petals topped by a dark purple 'berry' and yellow stamens. Its presence is testament to the undisturbed nature of the woodlands in which it grows. Herb Paris is always very localised and is becoming scarcer throughout the UK. Green Hellebore (Helleborus viridis) is also very localised and quite rare, being confined to limestone woodlands in the southern and central parts of Britain. It is a member of the Buttercup family (Ranunculaceae) and has large, spreading leaves that die back during winter (unlike the leaves of Stinking Hellebore (Helleborus foetidus) which are evergreen). 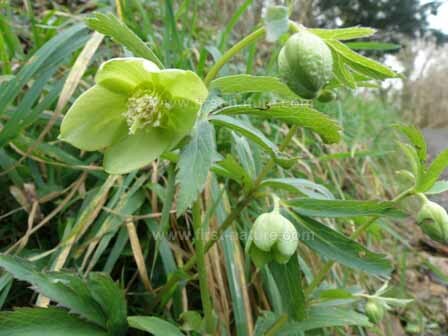 Green Hellebore flowers from February to April and can form large clumps. They look very much like some of the cultivars that we grow in our gardens. Also rare is the Bird's-nest Orchid (Neottia nidus-avis) which grows in leaf litter and usually blooms around June. It is hard to spot because it lacks green colouring and is therefore unable to produce its own energy; instead it depends entirely on other plants for its sustenance. Bird's-nest Orchid grows on the root-like rhizomorphs of fungi that also live on the woodland floor. 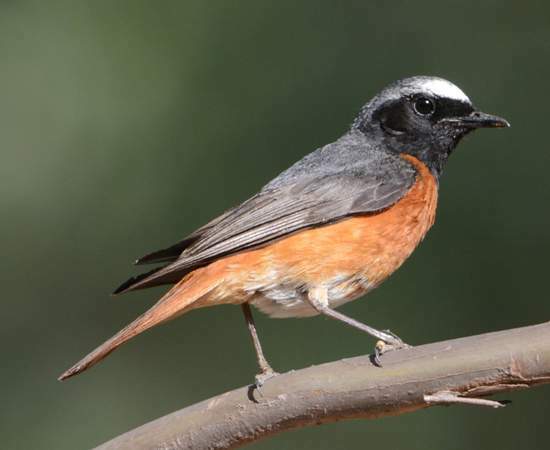 Below: Redstarts are among the many birds that nest in Penhow Woodlands in spring and summer. Penhow Woodlands is also one of the places in which to see Tintern Spurge (Eurphorbia stricta), also known as Upright Spurge. This plant is common in damp, grassy places and grows beside streams and in ditches but only in limestone habitats. The milky 'latex' that seeps from broken stems is poisonous if swallowed and if handled it can also cause intense skin irritation, so this plant is best admired from a distance! This woodland NNR is a good place for seeing migrant birds that visit us in spring and summer to raise their families, and many species been recorded there. Breeding birds on the reserve include Bullfinches (Pyrrhula pyrrhula), Pied Flycatchers (Ficedula hypoleuca), Redstarts (Phoenicurus phoenicurus, Tree Pipits (Anthus trivialis), and various warblers. Spring is one of the best times to visit this lovely woodland, but Autumn, when the fungi appear in greatest abundance, is also very good.